Its another date out with the husbter over the week before we began a 72 hours of work marathon (with 2 hours of sleep a day). So some proper soul food was needed and what best than to head into Morganfield's for some good old fashioned pork ribs? And as such, we opted for something refreshing and alcohol free. 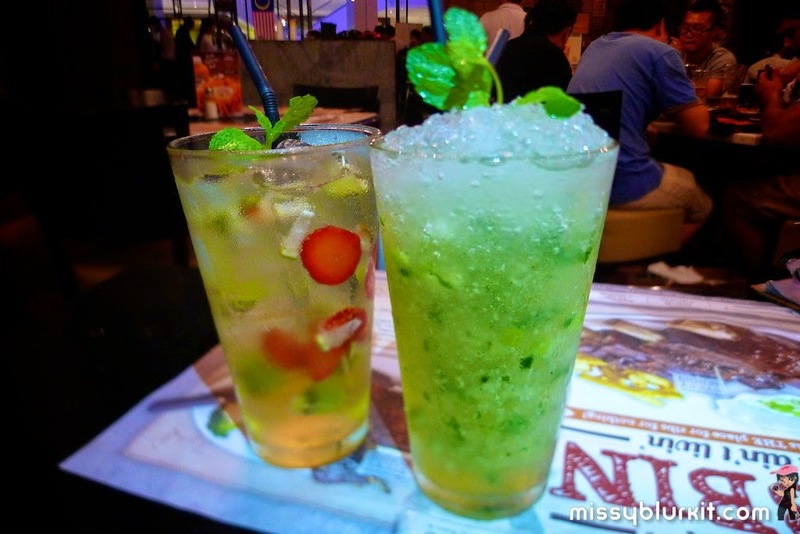 Though honestly nothing beats a nice pint of beer to go down with some ribs but heck work beckons so we were honestly rather happy with my Virgin Apple Mojito RM14.90 and the hubster's Begonia RM12.90. I love a good mojito anytime even if its alcohol free. A lovely concoction with just the right balance of fresh apples, lime chunks, mint leaves and sugar with soda making this one of the better virgin mojitos in town. If you like something sweeter then the Begonia with kiwi, strawberries and lime will be a good bet. We're all ready to dig into our ribs that arrive quite quickly...good thing with prompt service because I was actually quite famished after I touched down from the airport. 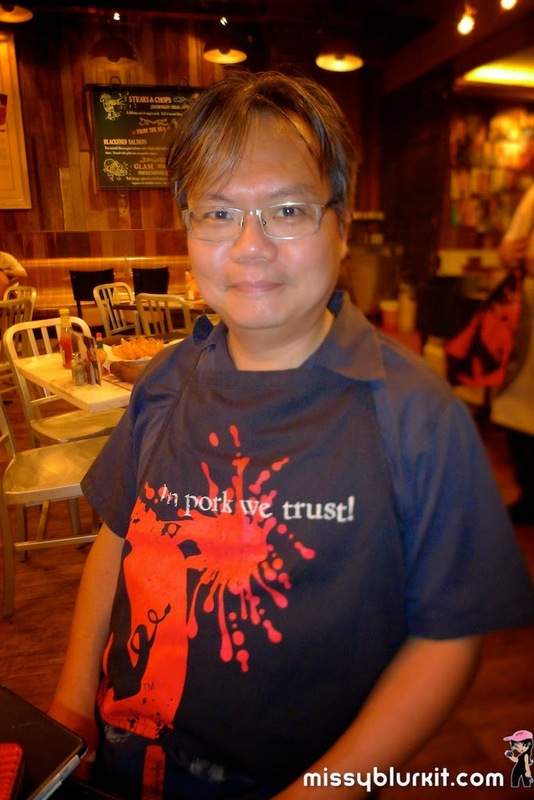 Aprons are given because one can get messy while attacking the ribs. Nicely marinated and cooked to perfection ribs render a use of your hands to hold on while you nibble and lick of every ounce of goodness attached to each bone a MUST. 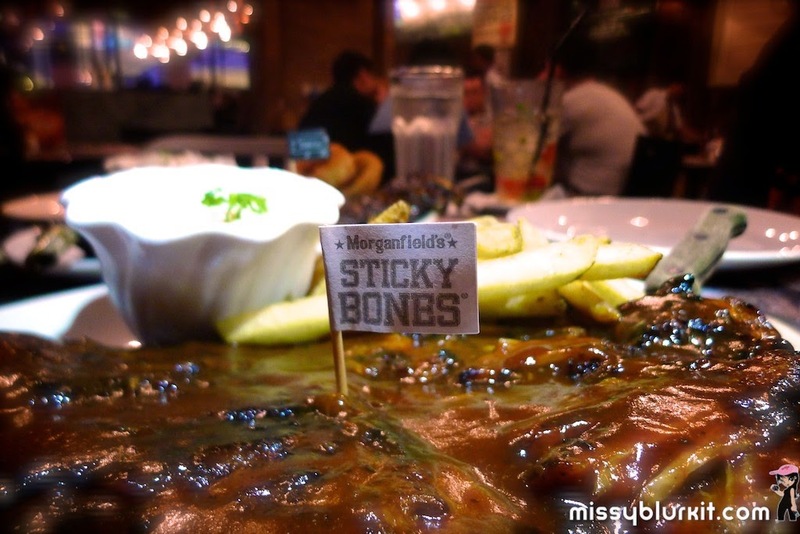 No need to be shy because just about everyone ends up doing it at Morganfield's. 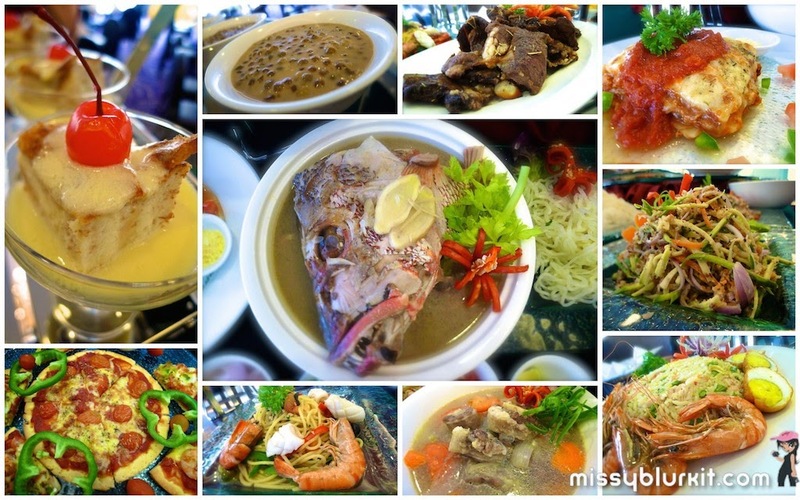 2 options for us and each serving is quite a meal of its own if you are a small eater. Eat your vegies and when its served in a creamy coleslaw style, that's pretty easy for most folks. Nicely marinated and slow cooked making it totally tender with a nice rich hickory smokiness to it...this was the hubster's obvious favourite. Its layers and layers of Hickory Sauce that basted during cooking so its definitely lots of flavour from the skin till the bones. A nice pairing with the french fries that is part of this platter. 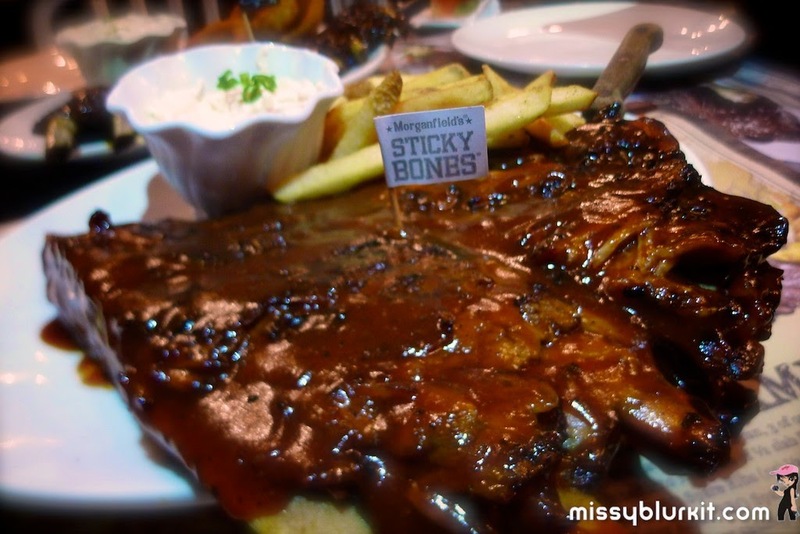 This award winning Morganfield's own recipe is my regular favourite. Its flavourful but not as strong as the Hickory Smoke. 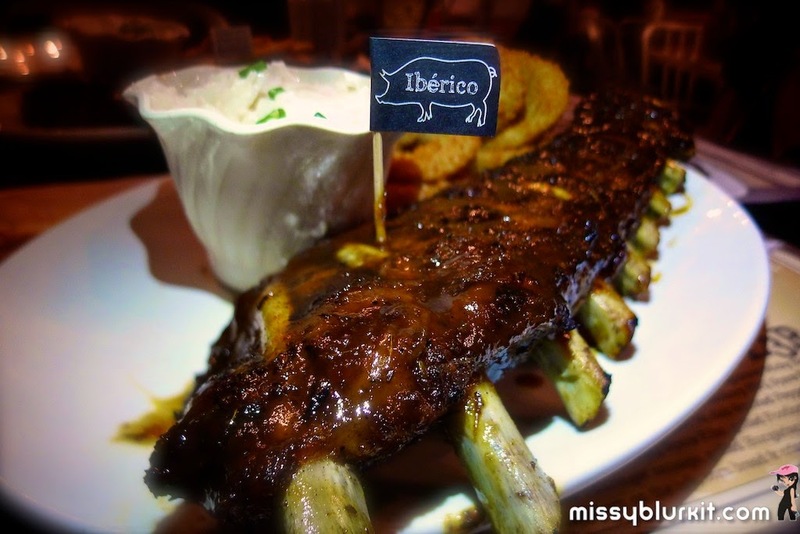 And since its Iberico Baby Back, its definitely more tender than the usual. The menu says it "will surely get you begging for more" and I must say its true. I will happil have another serving of this anytime! Served with some definitely good crispy onion rings...heck this is one good comfort food before spending 3 straight days in the work studio. 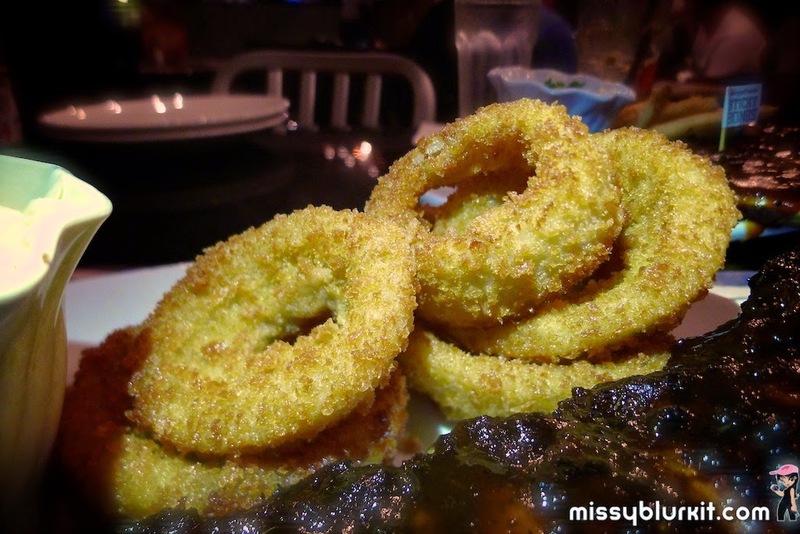 You got to admit these onion rings are begging to be eaten immediately! If I had 10 AirAsia FREE seats, I will like to head off to Hong Kong for the Standard Chartered Hong Kong Marathon 2015 with my running buddies. I had the most wonderful run in Hong Kong this year and it will be nice to head in again next year with the running buddies again. 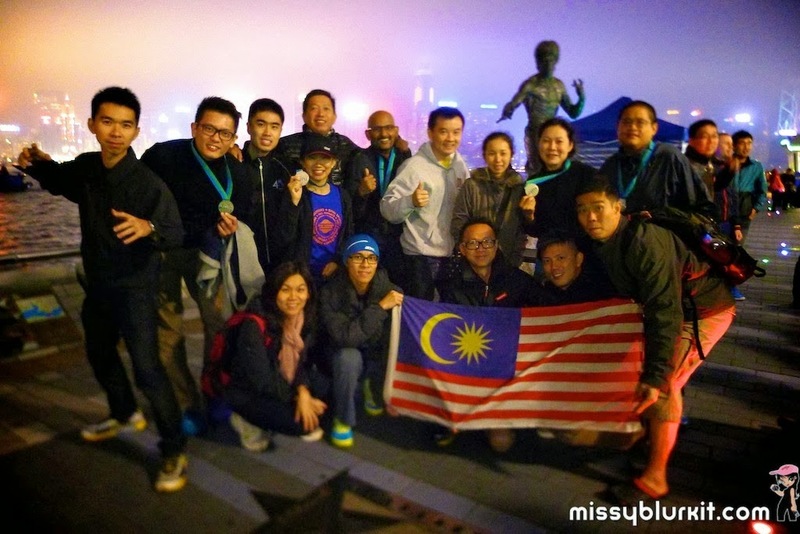 Would be certainly fun to grab another picture with our Malaysian flag and our medals after we complete our race! 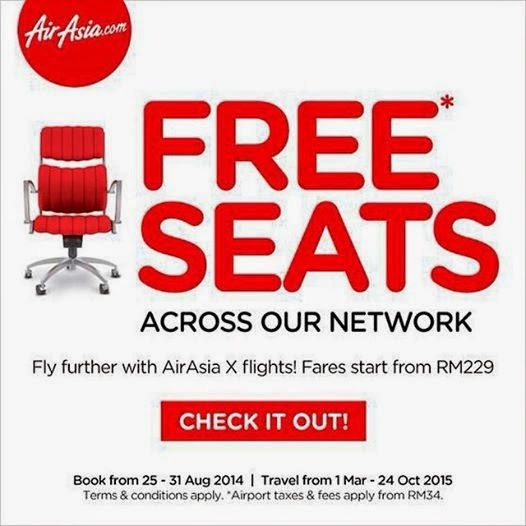 So while I hope a genie grants me 10 FREE seats, thankfully its FREE seats again by the folks at AirAsia. So folks and in particular my running buddies who want to race overseas, do make your bookings from now till 31st August 2014. And remember that your travel dates are between 1st March 2015 to 24th October 2015. Hurry! BTW, I fly off tomorrow to Vietnam for the Da Nang International Marathon. Wish me luck and do stalk the following channels for more daily updates from Da Nang! 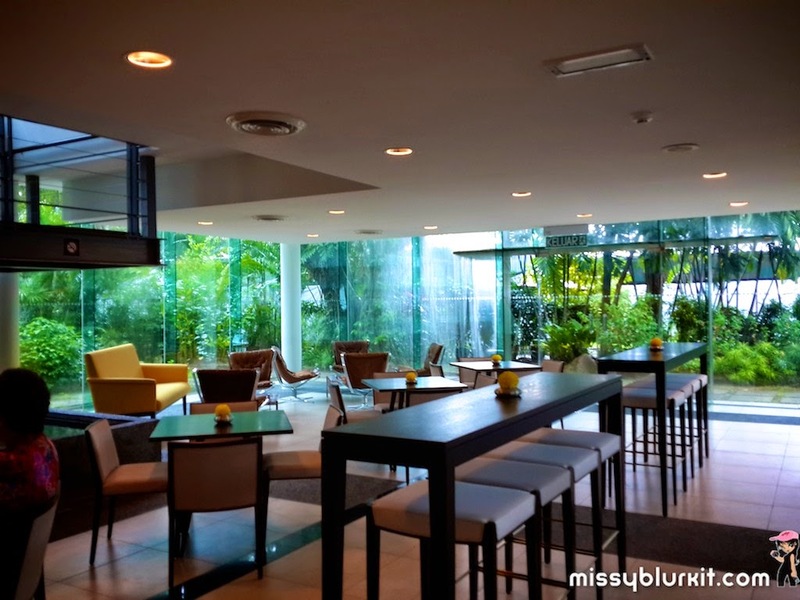 Silka Cheras is the latest addition to the family of Silka Hotels. Smack beside the newly opened Cheras Sentral Mall, a visit to either the mall or the hotel is not complete without visiting the other. And that's precisely what a bunch of us did last week. 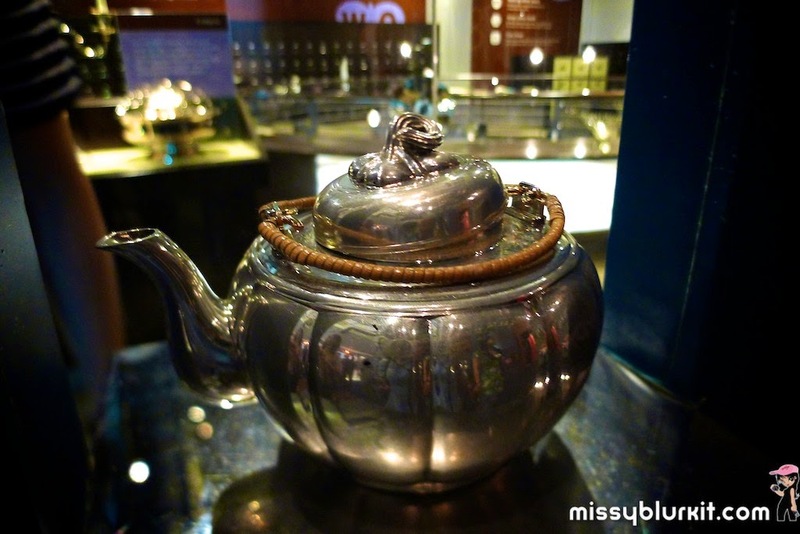 A favourite spot for the hubster and I to have our dates outings would be the Royal Selangor Visitor Centre. Lost count of our visits from 4 years of dating and 13 years of marriage but each visit is always fun and memorable. 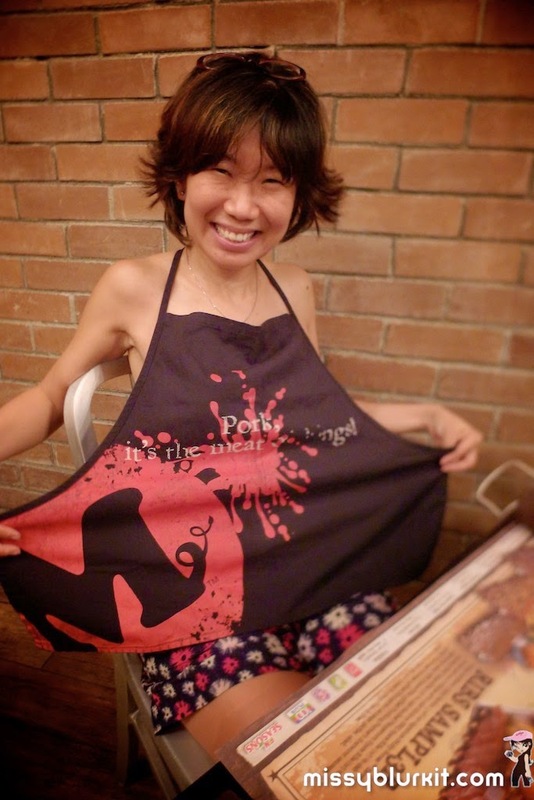 From walking through the showroom to having a lil meal at the cafe, checking out how pewter is made or even trying out our hand at the classes offered, I honestly can never have enough of this awesome place. Our latest visit has been another memorable outing with some awesome souvenirs to celebrate our 13th wedding anniversary. 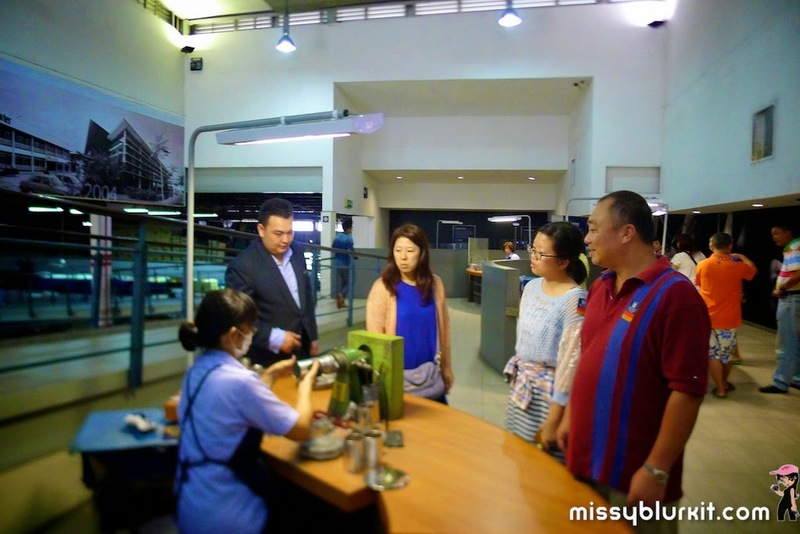 And because silly me forgot to bring along my wedding bracelet this time around, another visit to the Royal Selangor Visitor Centre is a must for me to lengthen my bracelet at Selberan Jewellery which is also a subsidiary of Royal Selangor. 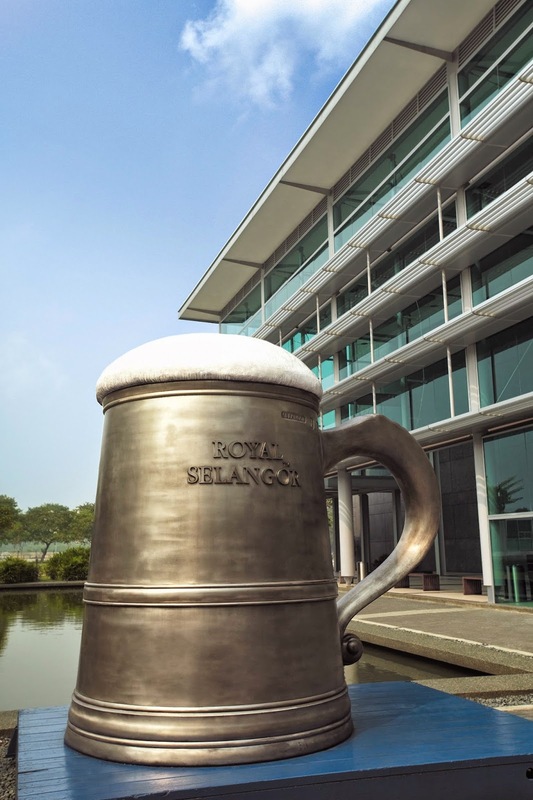 I initially wanted another picture with the Giant Tankard at the entrance of the Royal Selangor Visitor Centre. Unfortunately the rain had to mess up my plan....so yes...another visit so I can grab a picture with my short hair do. LOLZ. This is the world's largest tankard. It took 6 craftsmen in 2 1/2 months and a total of 2,000 hours to complete the job - from the preparation of the moulds to the final polishing of the tankard. A quickie breakfast to fuel the body before we started with the activities that was lined up for us. 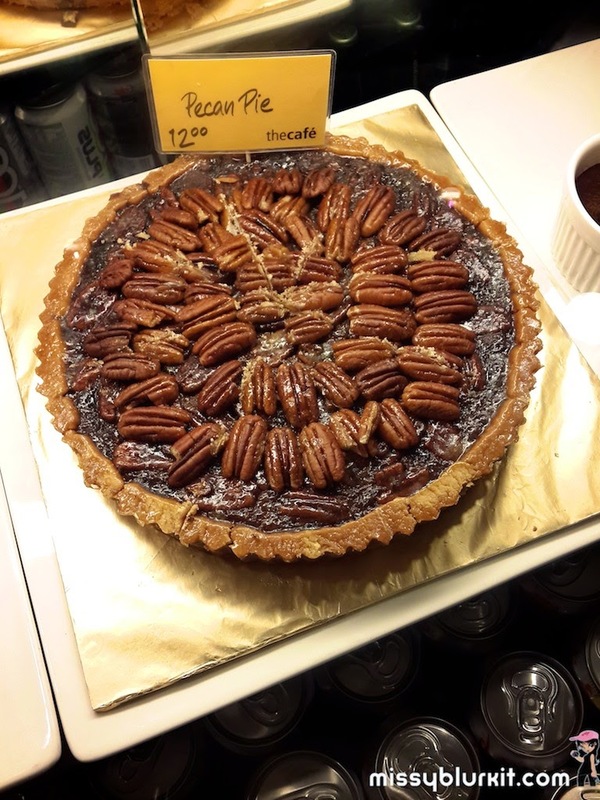 Love a good cup of coffee and the pecan pie here on just about every visit. And if you have teh time, then this is a lovely spot to chill with your pals too. Pewter items are really a labour of love and art. Check out the Pewter Museum on the 1st floor. 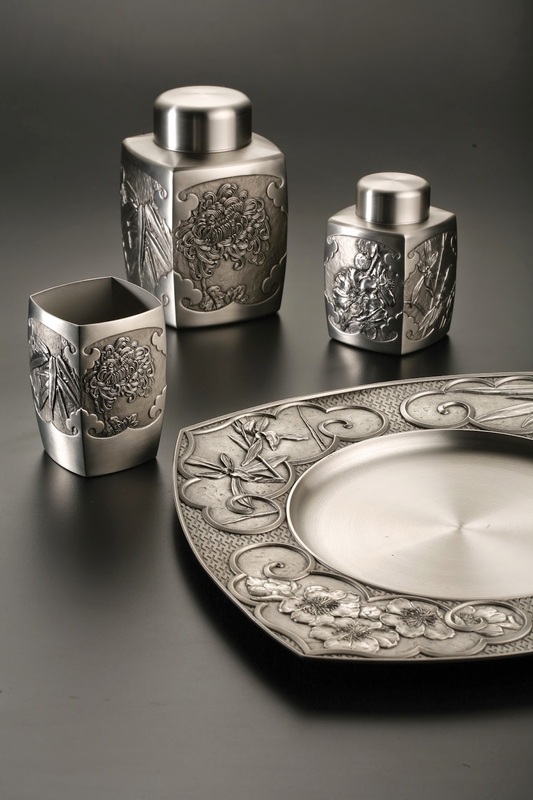 Learn about the rich heritage of pewter and its role in our country's history. 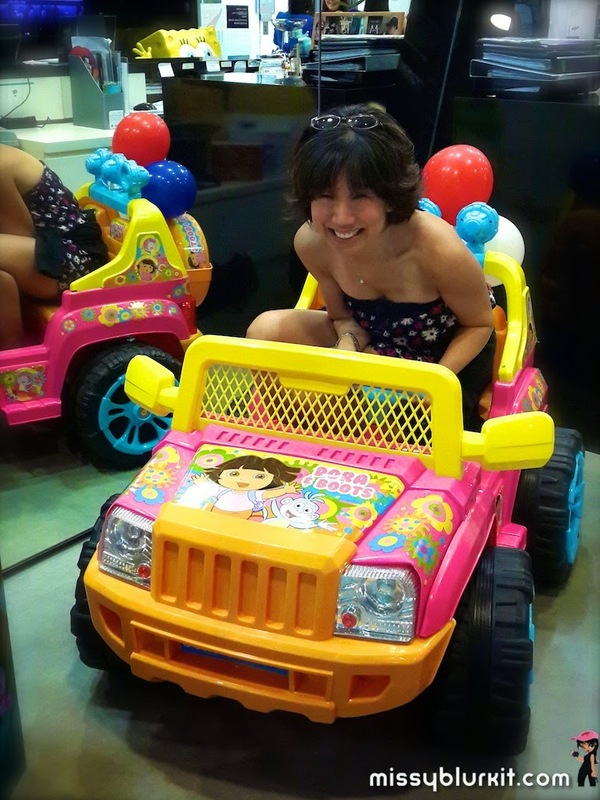 Have fun along the way in this interactive museum. 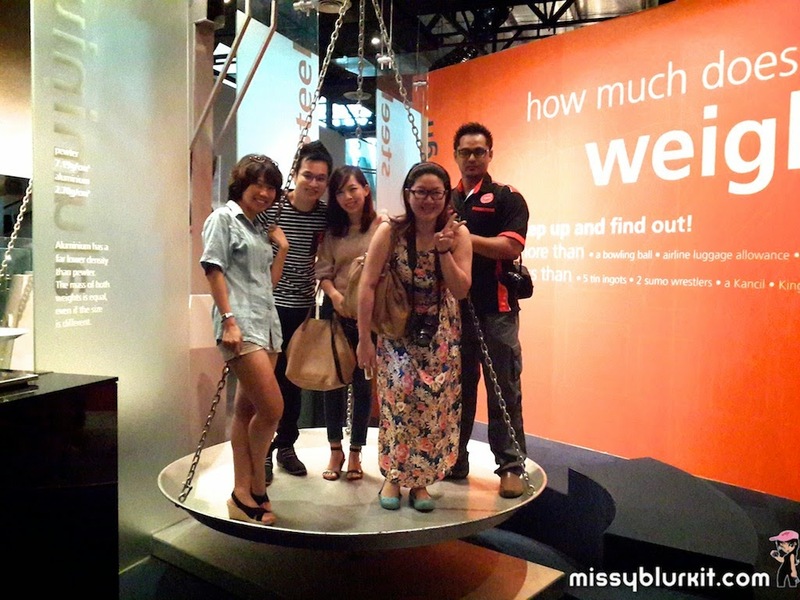 We had our fair share of fun playing with the pewter instruments and of course standing on the giant weighing scale. Lots of wows and ohhhs along the way. Trying to tilt the scale and the 5 of us weren't heavy enough to even move it! There is a long story to this Melon Teapot that saved a man's life. Make sure you get to hear about it. And if you like, this Melon Teapot replica is also available for you to buy to bring home. Pewter keep your drinks hot for a long time and cold drinks cold for a long time! 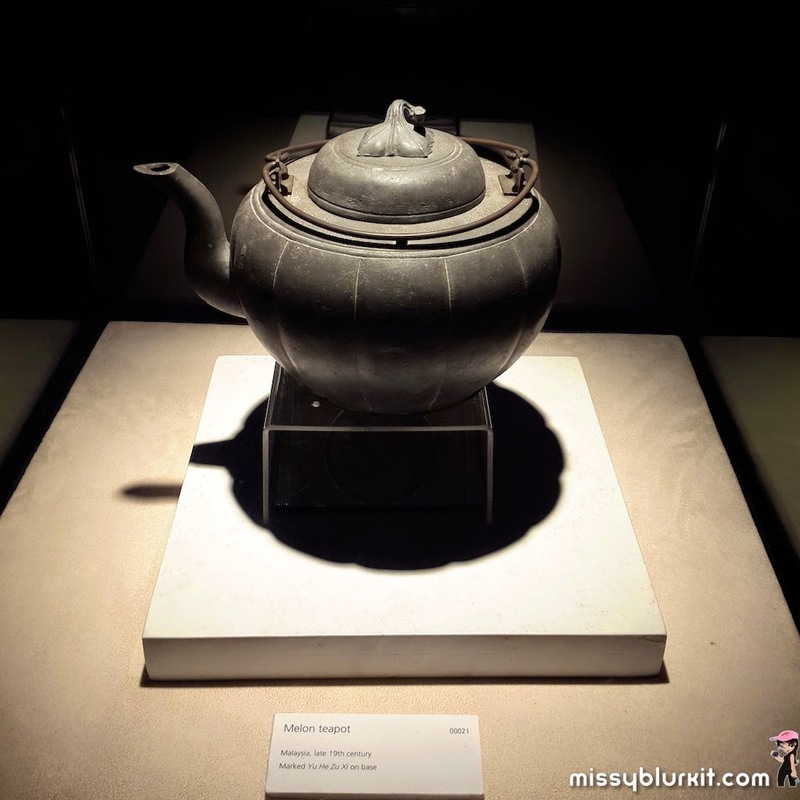 A replica of the melon teapot. 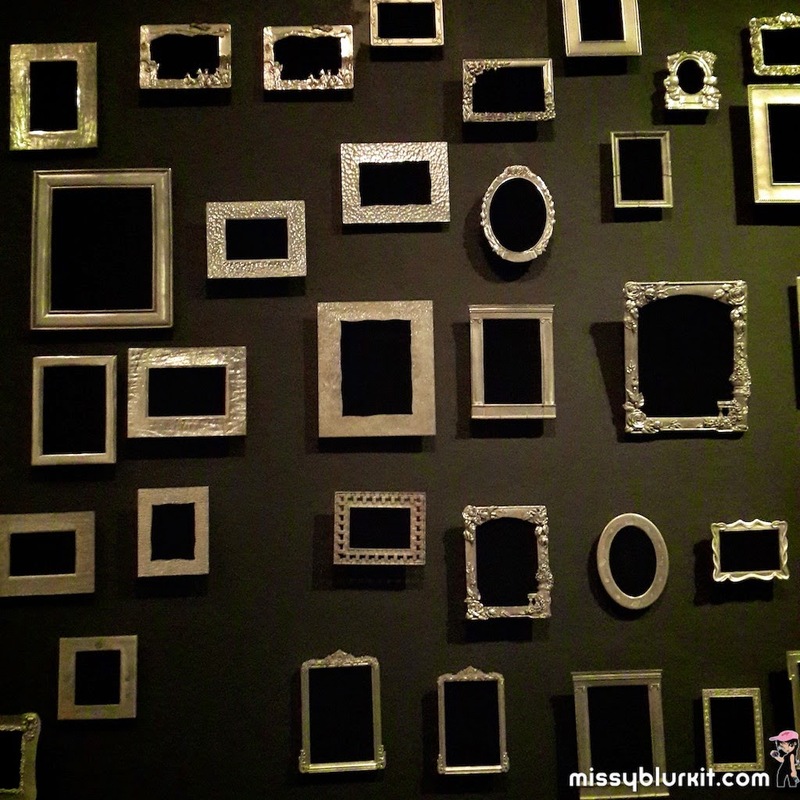 A gallery of frames bring you through the different style and history of picture frames. Would certainly love to add some pewter frames to my existing collection of pewter mugs at home. 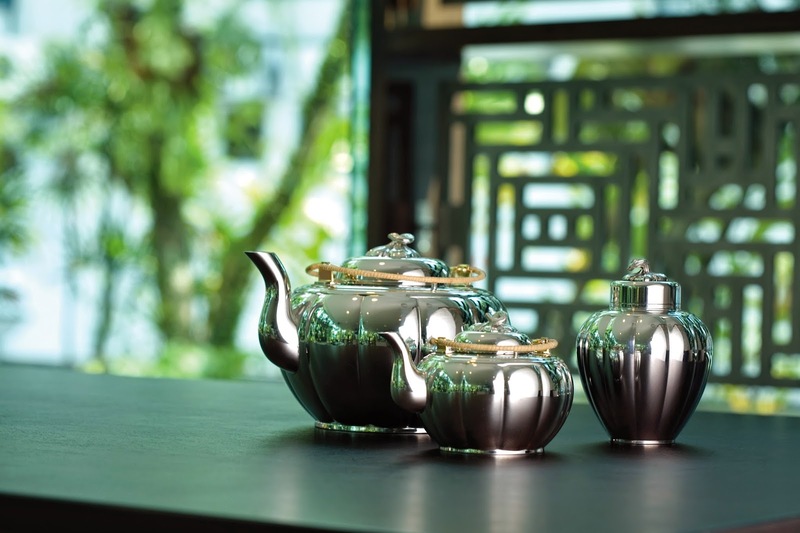 The majority of Royal Selangor pewter products are hand-cast. Check out how each item is made by the craftsmen. It might look easy but its years of training that has resulted in them being so skilled. It begins with the craftsman pouring molten pewter into steel moulds quickly and efficiently. From experience he would know the angle of pouring that would allow the molten pewter to flow smoothly into the mould, ensuring that each casting is well-formed. After cooling, the item is removed from the mould. Rough edges are carefully filed and then polished. 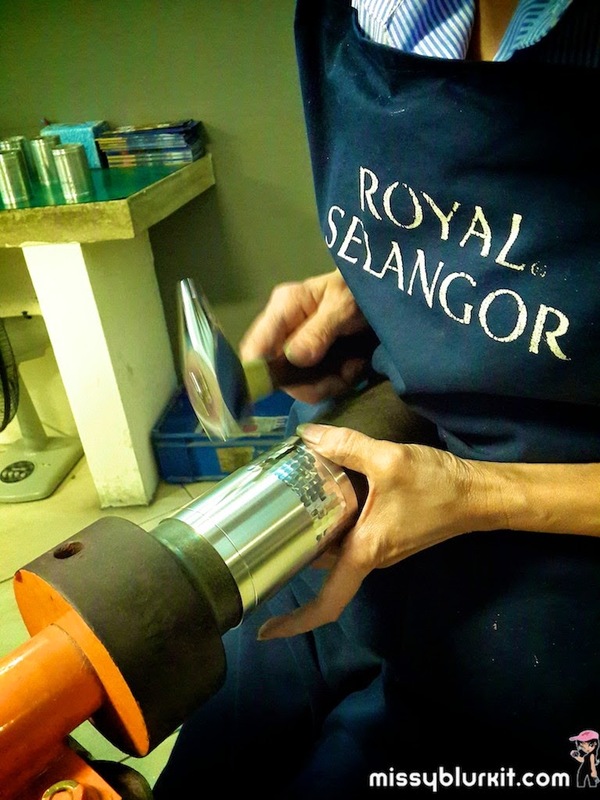 Each individual Royal Selangor pewter product is polished by hand. This is because it takes a great deal of skill to remove the yellowish patina that forms on the surface. Polishing is done using a fine-grade sandpaper or against a buffing wheel. Once the polishing process is completed, appendages such as handles, spouts and hinges are soldered on. Skillfully made joints are virtually invisible and remarkably strong. After soldering, the finished product is polished once again with soft flannel or, in some cases, with the `stone leaf’ (Tetracera scandens), a wild tropical leaf of a fine, abrasive nature. 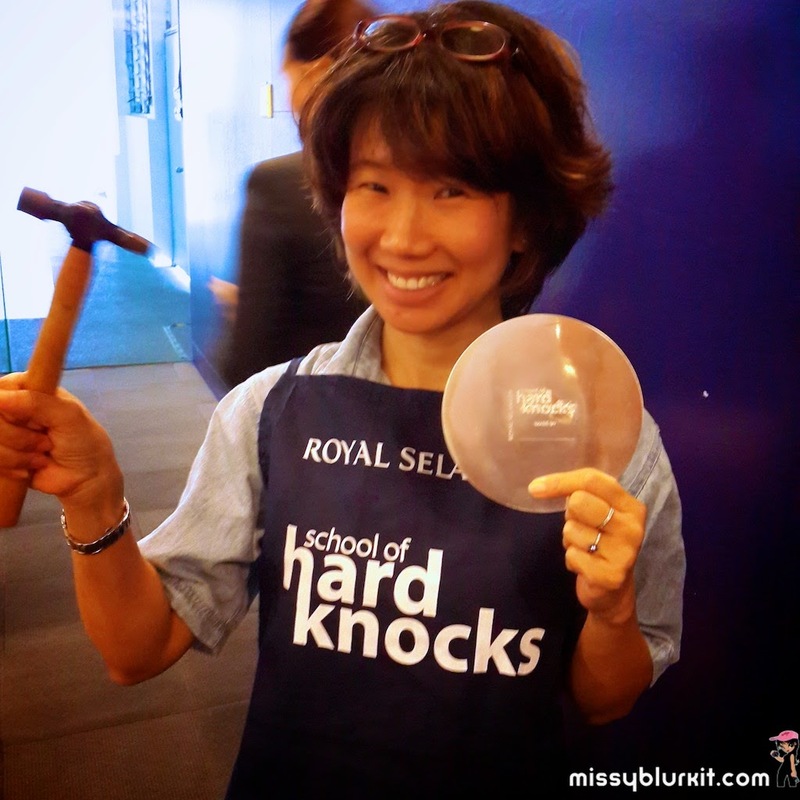 And if it all looks easy to you...then give it a try at the School of Hard Knocks for some hands on pewter fun. 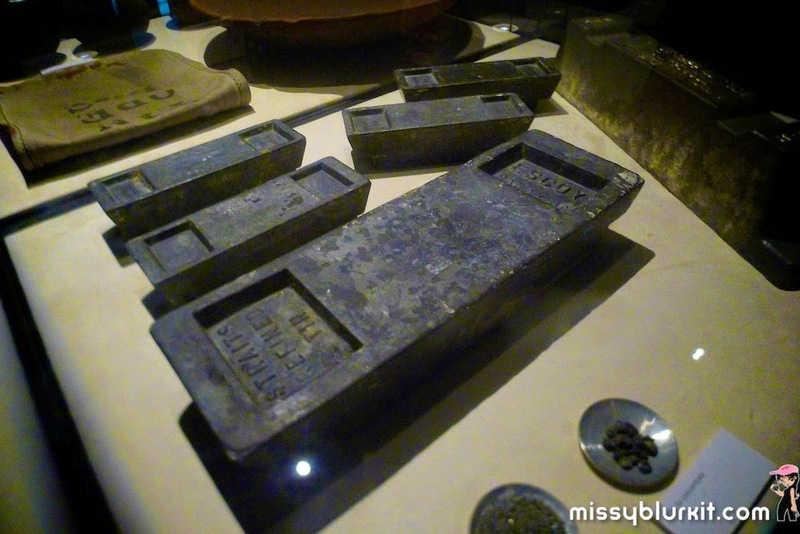 For RM60 you get lots of fun crafting your own pewter dish using traditional pewter crafting tools and you get to bring home your master piece. Alternatively, if you think you want to make something finer like a pewter accessory then the Foundry classes will be perfect. 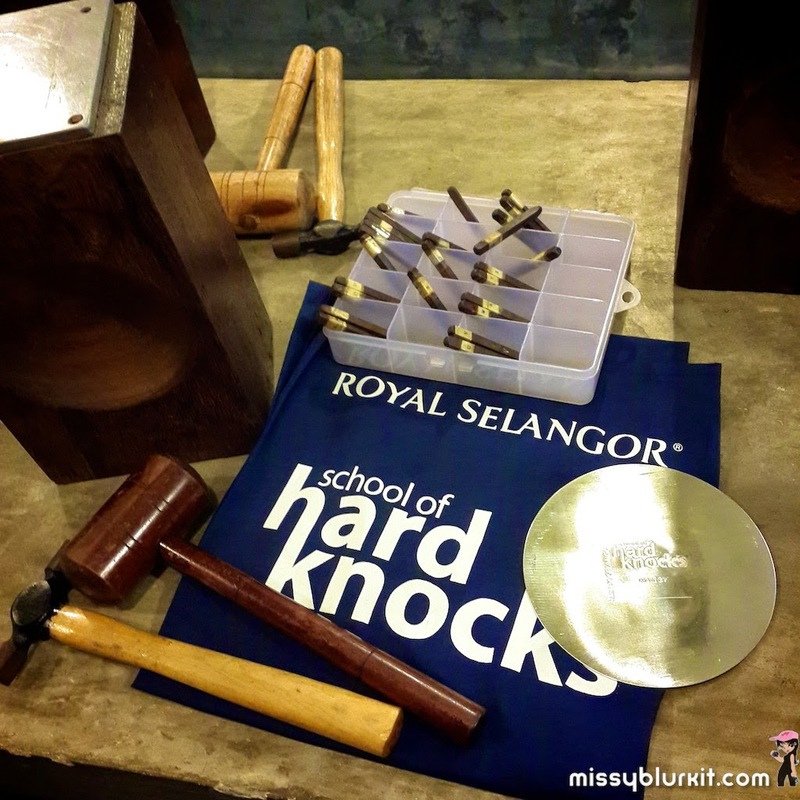 From now till 19 October 2014, the foundry classes are going for RM150 for 2 persons - buy 1 FREE 1 only if you use this code "FOUNDRY MBK" at the Royal Selangor Visitor Centre or when you make your Foundry classes reservation via visitorcentre@royalselangor.com.my. 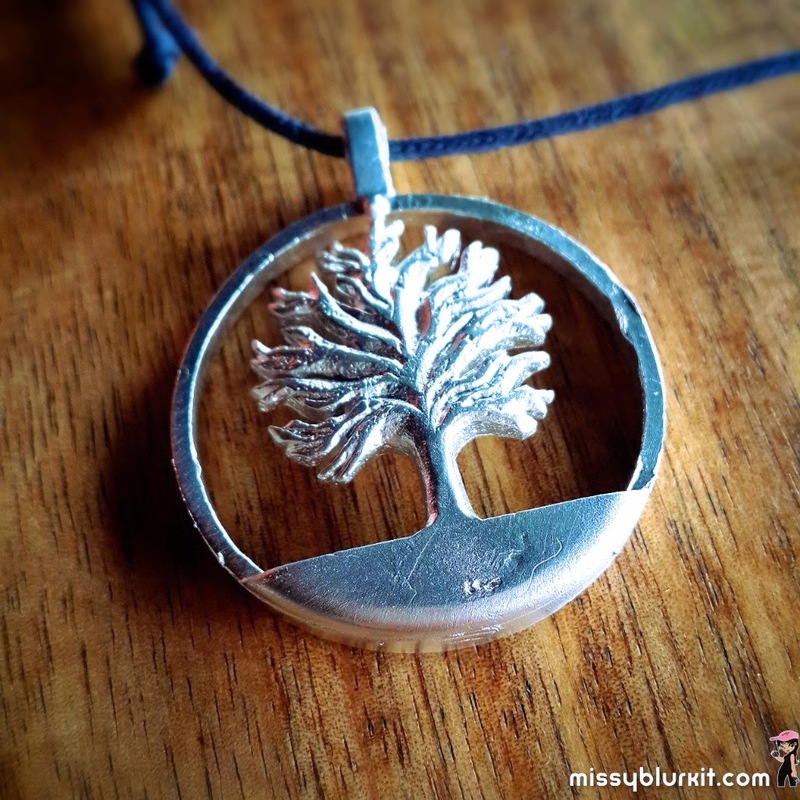 During the Foundry classes, you get to have hands on experience of pouring molten pewter into moulds, polishing your master piece and taking it home. And if you are good, try your hands on free hand creatives. Since it was our wedding anniversary, the hubster made me a gift. Pretty? He did a good job making it in under 15 minutes. And if one wants to bring home more pewter goodies, then check out the retail offering at the centre. 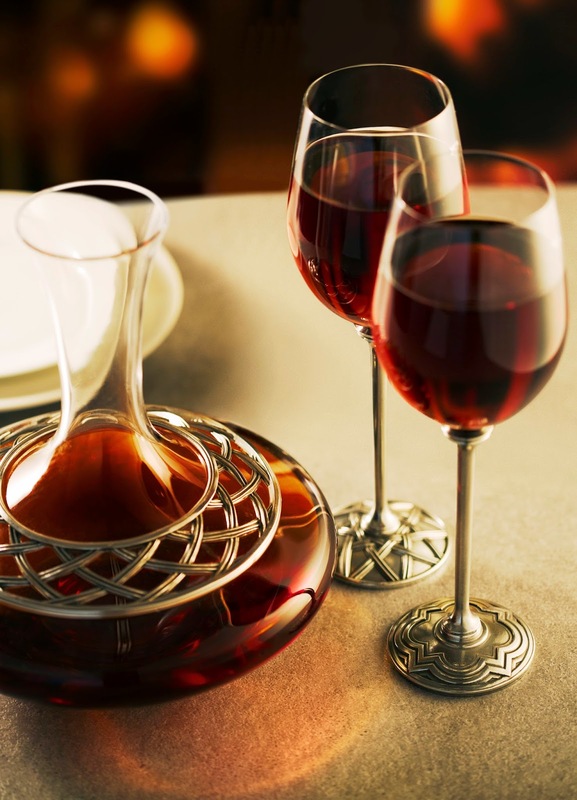 There's plenty to choose from including tableware, traditional tankards, elegant tea sets, captivating photo frames and more. The new addition to our home is this Royal Selangor spice grinder. Practical and pretty. Stylish too! And in case you are reading this and would like to indulge in some online shopping therapy for Royal Selangor goodies, then head on to http://www.royalselangor.com/blog/register and key in the code "EVBMK" to enjoy a RM30 e-voucher for your online purchase. This e-voucher is usable for all products on the website. Hurry because this special offer ends on 19th October 2014! For those who have not made their way to the Royal Selangor Visitor Centre, take the opportunity to do so this long Merdeka weekend! Packed my luggage for a mini getaway for the coming long Merdeka weekend. Its been some time since I visited Vietnam and Da Nang is the choice destination this time. Some asked why Da Nang? Other than being a short 2 hours and 55 minutes flight time away, the following will be my reasons to fit into a mini getaway. 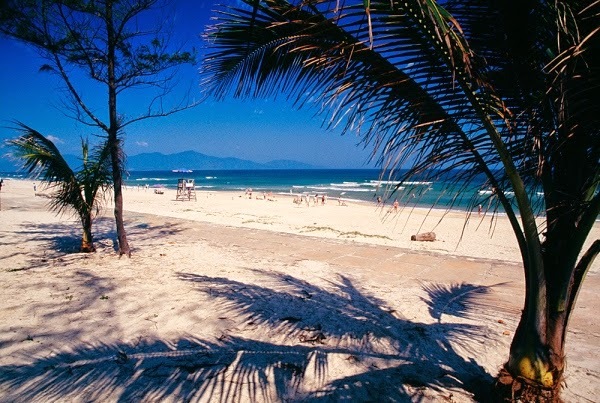 • Da Nang is home to UNESCO World Heritage site. 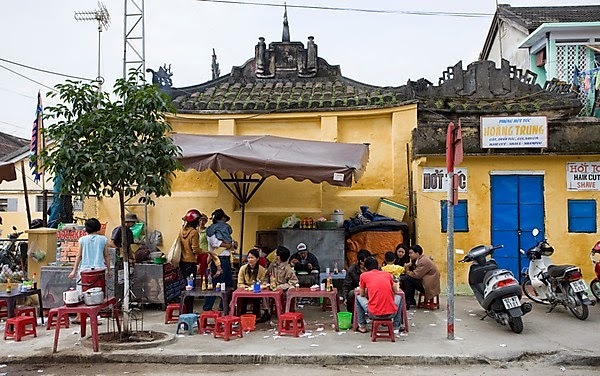 The ancient town of Hoi An, a well preserved town dating back from the 15th to the 19th century that reflects both local and foreign influences combined to this once South East Asian Trading Port. • Scenic and green nature including Marble Mountains (Ngu Hanh Son) and Pagodas. • Shopping! I can shop to my heart's galore including having custom made dresses and coats within 24 hours. 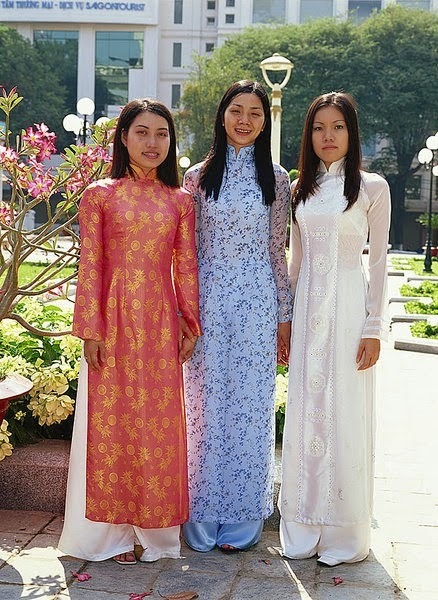 I love the Vietnamese Ao Dai and will be having a few made during this visit. 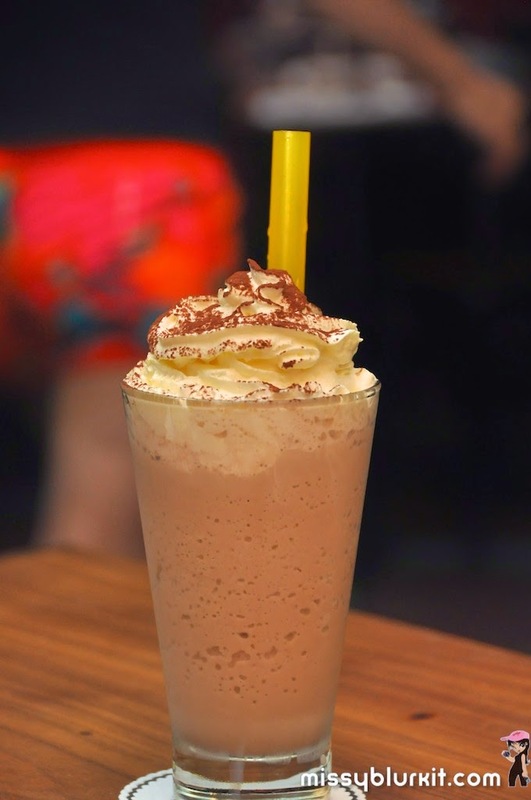 • I love coffee so I reckon I will be joining the locals in their local culture of drinking coffee. • Food, food and more food. 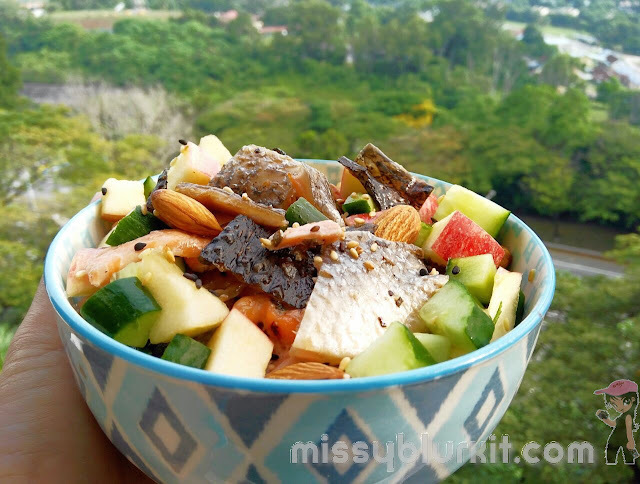 Its always fun to explore the cuisine of another country! 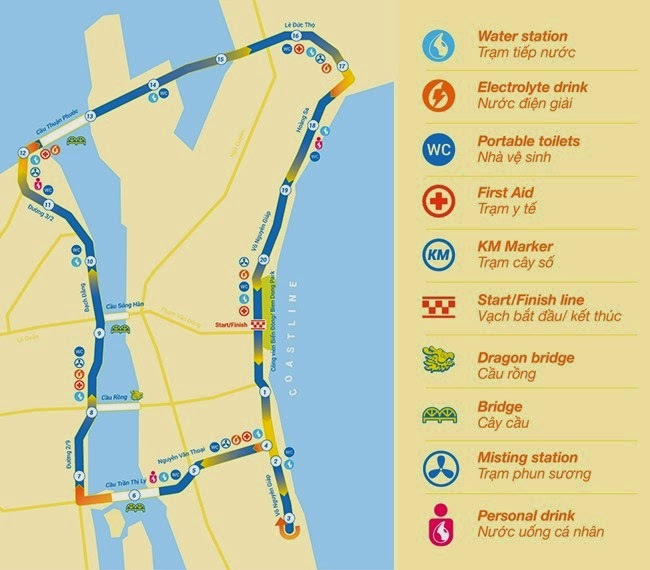 Da Nang International Marathon will be held on 31 August 2014. And if you make the decision to run then its not too late to sign up. Late registration is possible until 31st August 2014 at the Da Nang International Marathon's Expo & Packet Pickup at Bien Dong Park on Vo Nguyen Giap Street. There are 3 categories - Full Marathon (USD110), Half Marathon (USD90) and fun walk/run 5km (USD30). 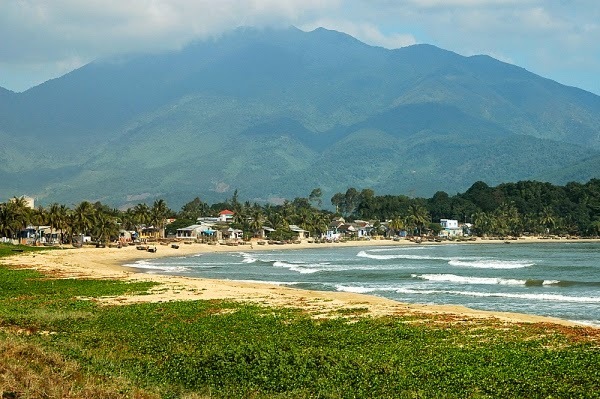 The runs will flag off from Bien Dong Park which is beside the beach and will take us through Da Nang with a good showcase of Da Nang's beautiful views with an introduction to Da Nang's local specialties such as tropical fruits, local food, handicraft products and souvenirs. Rest assured that this will be a good race to run in as the Da Nang International Marathon has been IAAF-AIMS certified to international standards with official timing record. The entire course is on concrete/tarmac surface as well with water stations every 2 kilometres! And to get your way to Da Nang, do check out AirAsia as they will begin flying to Da Nang beginnng this Friday 29th August 2014 with 4 flight in a week - Sunday, Monday, Wednesday and Friday. In case you are wondering about the Da Nang flight...well, its back again after being canned for a short epriod of time. The reintroduction of the route comes along with an amazing rate with all-in-fares from as low as RM99* one-way. Booking period is from now until 15 June 2014 for the travel period from 29 August 2014 – 31 July 2015. Book your tickets quick on www.airasia.com. Caught the live screening of the MTV VMA held LIVE at The Forum in Inglewood, California this morning. 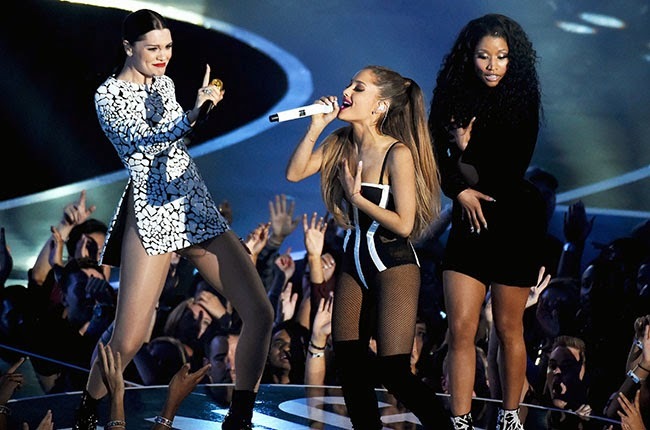 It opened with Bang Bang by Jessie J, Nicki Minaj and Ariana Grande which pretty much set the awards on an energetic mode. The music video for Bang Bang is now on BangBang.mtv.com. Watch it...and let me know your thoughts. Did you spot anything? The highlight and I must say the best act had to be Queen Bey herself. 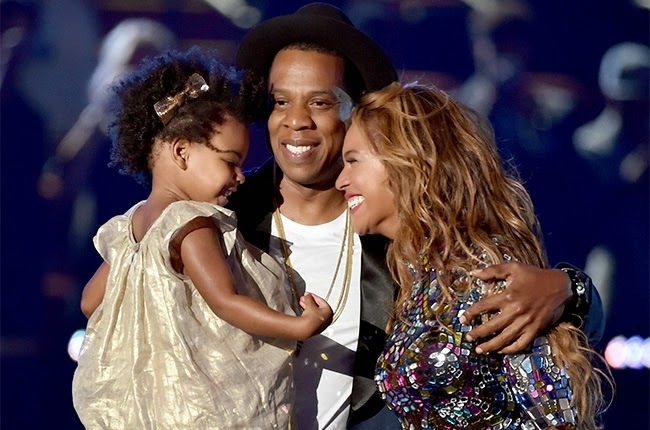 JAY Z and Blue Ivy presented the “Michael Jackson Video Vanguard Award” to BEYONCÉ. Her performance was energetic. She thrilled the crowd with her medley of songs from her visual album “BEYONCÉ.” It was beautiful seeing the backdrop of her family life from home movies and what really moved me was reinforced messages of female empowerment and sampled a powerful quote and call to feminism from the prominent Nigerian writer Chimamanda Ngozi Adichie. This VMA also took us through a few quiet solemn moments with tribute to Michael Brown who was shot dead early this month. Miley Cyrus who won the the “Video of the Year,” had a former homeless youth in Los Angeles named Jesse take the stage for her to accept her award on behalf of the 1.6 million runaways and homeless youth in the U.S.
Yeah...that's me this morning reporting the MTV VMA results live from MTV Asia's HQ in Singapore. Had tonnes of fun while doing the live coverage. THANX MTV Asia for the invite! 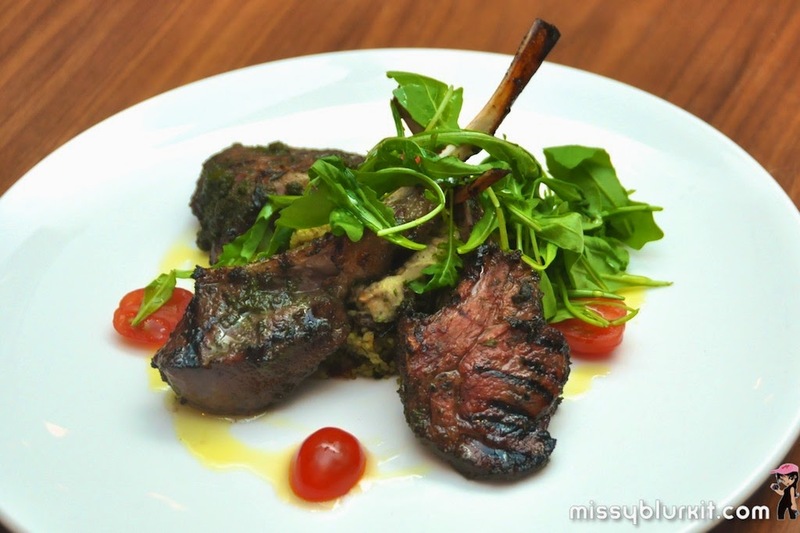 Another gem in Damansara Heights for us will have to be Mezze. A charming bar, bistro and lounge under one roof. I wouldn't call food fusion but its a delightful selection of Italian, French, Greek and even Sri Lankan and Vietnamese! And another reason to love Mezze would be is friendly team of waiters and Chef Yves. Oh...let's not forget its selection of wines as well! 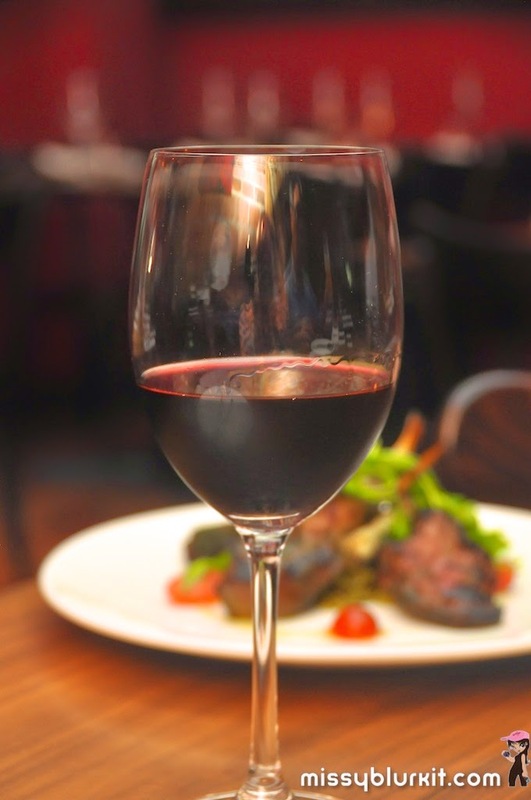 Happy hours and dinner for us a couple of days back at Mezze was a delightful one. It was nice to walk in to a warm ambiance. Love the play of lighting and space with the use of mirrors and warm lighting. It was rather bright outside since we went in straight after work but once we stepped in, it felt almost like we were at home and totally relaxed. Needless to say such ambiance played a big role in us enjoying our night out even more. 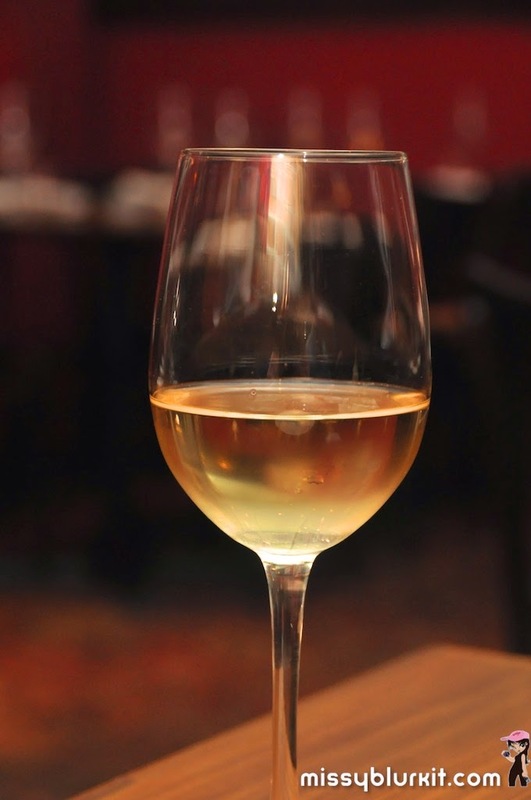 Freshly back from France, Ling suggested that I kicked off the evening with a nicely chilled Kronenbourg Blanc with a slice of lemon. A lovely suggestion and as the night went on, Sebastien the in house Sommelier helped paired our dishes with some wine as well. And if you fancy something non alcoholic the there's always teas, coffee and juices as well. I heard a lot about the beef noodles RM26.90 at Mezze. 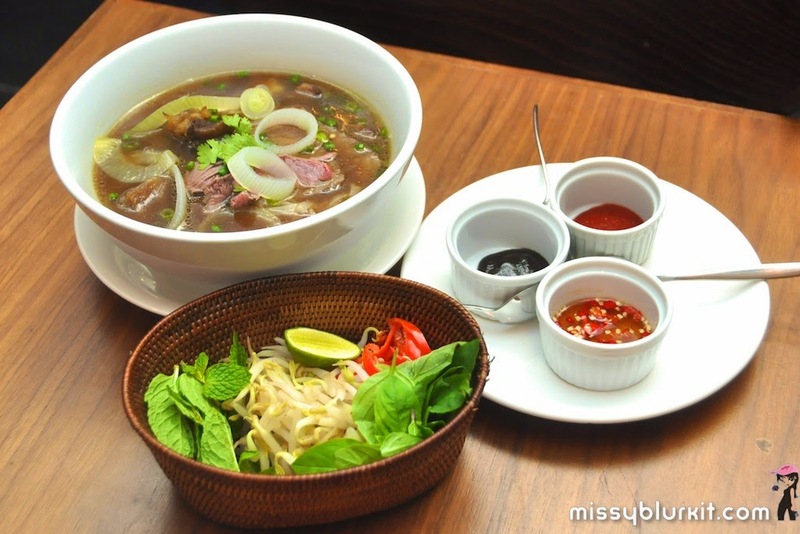 Its not quite your Vietnamese Pho but neither is it your Chinese beef noodles. Its a bit of both but made better and more hearty. 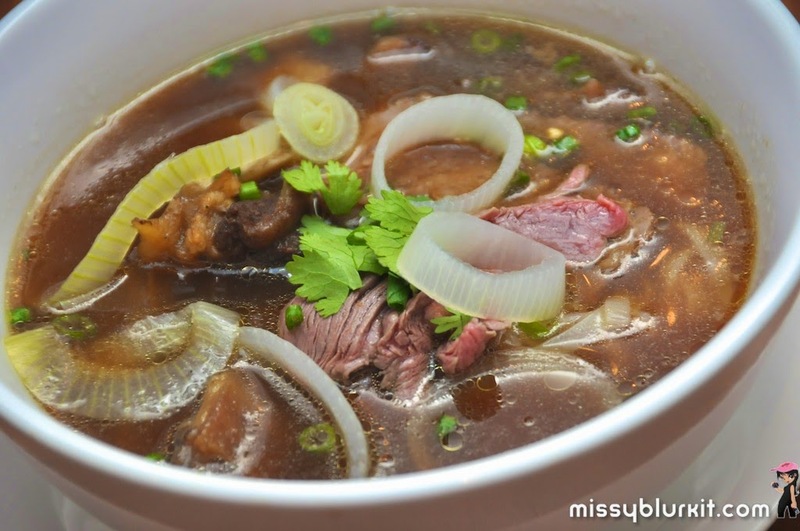 Its a delicious bowl of broth with tender pieces of sliced raw beef. And with oxtail added in as well, this dish is hearty, robust and almost stew like without being overly thick. So good that we finished up everything including the soup! Can't go by a day without my fruits or vegies. 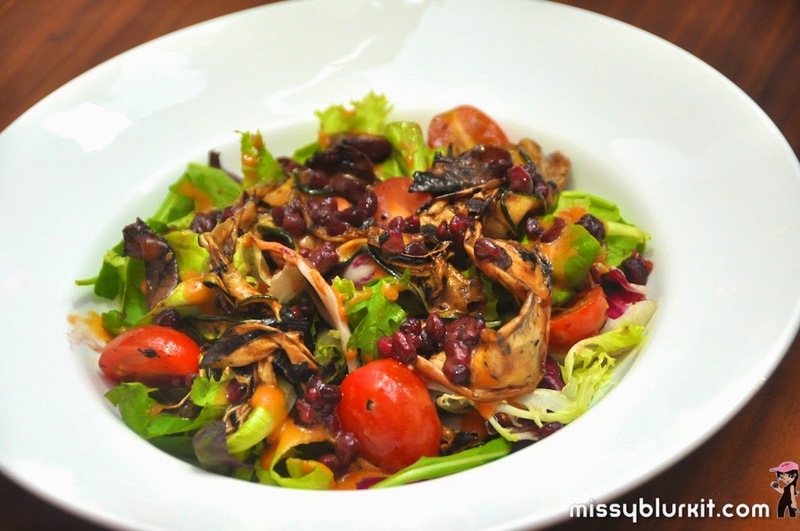 Mezze House Salad RM16 makes the best of both worlds. A platter of mixed baby rockets, plump cherry tomatoes, grilled vegies and sweet pomegranate. A toss with pomegrante mollases and olive oil makes this a delicious power packed meal. 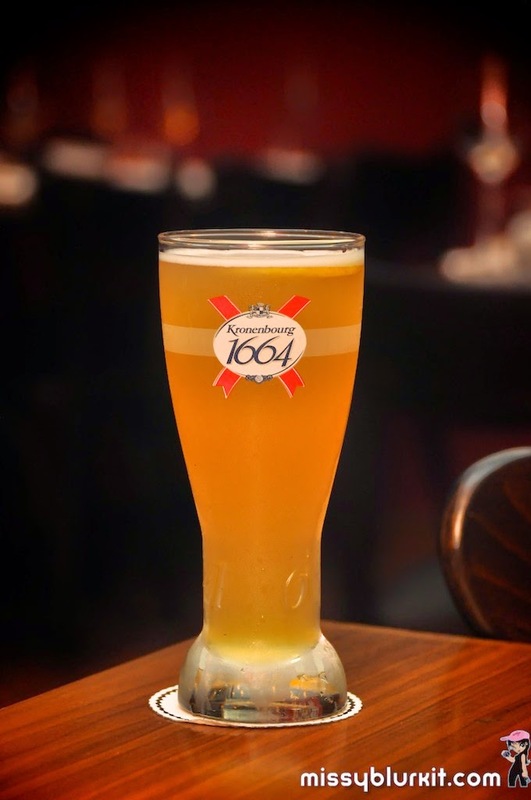 I started the evening with a glass of Kronenbourg and the Trio of Sausage Platter RM29. 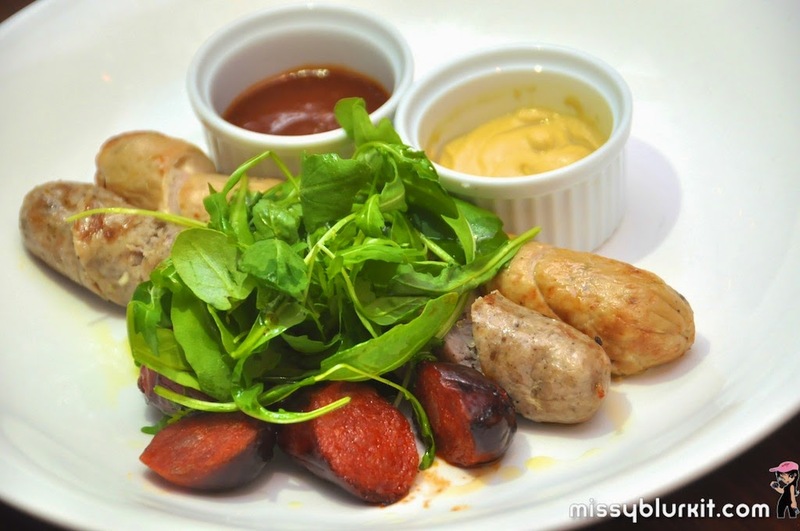 The selection varies each week and will include the sausage of the week which is made in house. I am generally contented to eat sausage as they are without any dippings. The house made smoky ketchup proved to be irresistible! Spicy chorizo, house made lemon fennel pork sausage and chicken cheese sausage. Topped with some baby rockets because it looks prettier and is a healthier meal too! Finger licking good so go ahead and use your fingers! Mezze has a good selection of tapas. 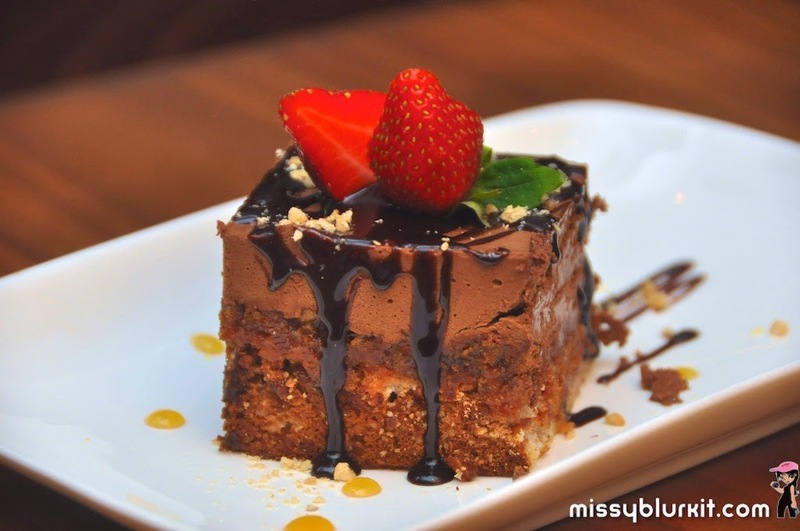 Servings are perfect for sharing or even good enough for one as a meal on its own. My cravings for spicy food was still running mad when we dined at Mezze. Naturally, the Vongole Chilli RM22 was a perfect dish. 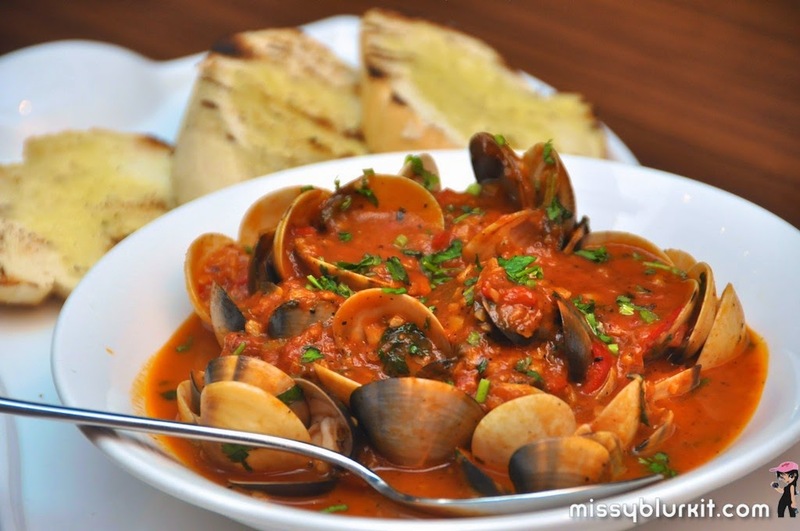 A generous serving of clams in a delightful spicy tomato sauce that went well with the buttered chargrilled toast that went really well with the sauce. The menu at Mezze is not overly extensive yet one can easily be at a lost of what to order because the dishes are really good. On my next visit...I need to bring a few more pals so we can go through its entire menu especially the meats and pastas! 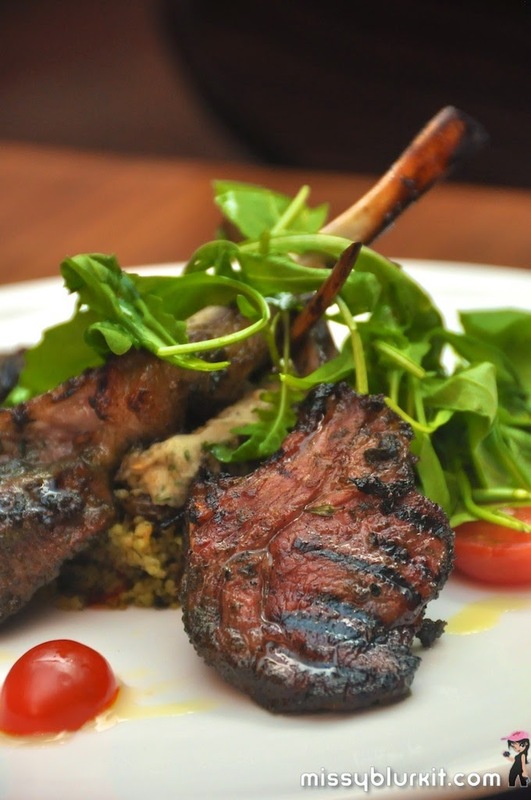 For those who love discounts, then head on to www.offpeak.my to make your reservations like I did so that you can enjoy between 20% to 30% discounts at Mezze. 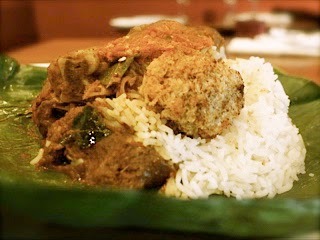 This is a special Sri Lankan dish known as Lamprise or Lamprais. The rice is a special variant known as Samba and is cooked in a special broth with an assortment of spices including cardamom, cinnamon, and lemongrass. Its served with an option of beef or chicken curry together with an assortment of condiments. 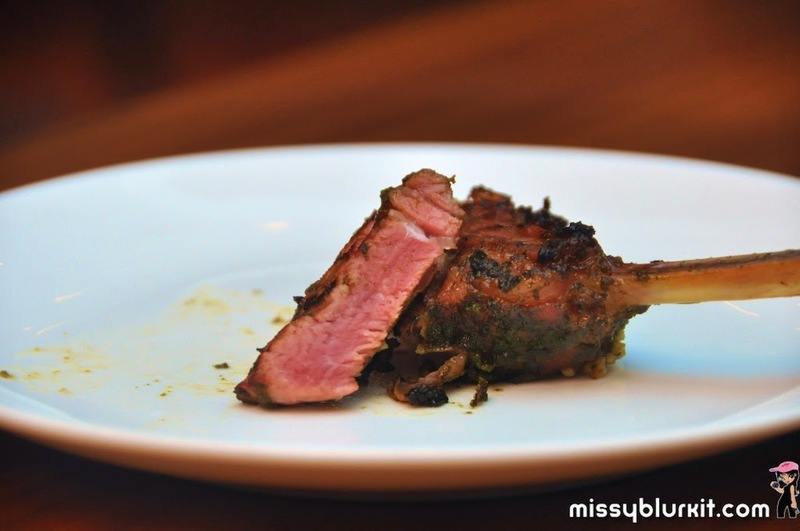 Mezze prepares this dish from time to time on selected weekends and it sells out really quick. They are cooking it again on Saturday 30th August 2014. So do make your reservations for this delicious bundle wrapped in banana leaf.